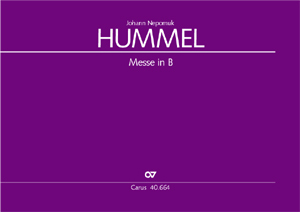 The House of Esterházy commissioned what are probably some of the most important masses to be written at the turn of the 18th to the 19th century: Joseph Haydn’s last, six great masses, Beethoven’s Mass in C major and the masses of Johann Nepomuk Hummel. 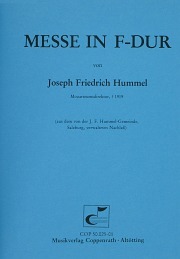 The resonance in the contemporary musical press upon the publication of the B flat major Mass of 1816/17, Hummel’s first Esterházy mass, was exceptionally positive. 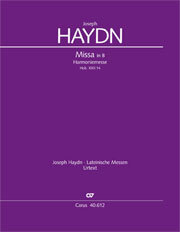 In addition to the rather simply constructed wind parts, which can also be played by the organ, the work places greater demands on the strings and choir (without soloists) to master an effect-laden, expressive diversity ranging from pastoral simplicity and martial trumpet calls to artistically wrought fugues which is rarely encountered. 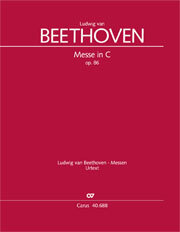 The present new edition offers the first scholarly-critical edition of the work in a reliable musical text, including performance material. Die Carus-Ausgabe lässt keine Wünsche offen: klares Druckbild, informatives Vorwort (in drei Sprachen) und zahlreiche Querverweise.